How do you reconcile this approach with the demands of Christianity to submit to authority (Scripture, the Church, sensus fidelium, etc)? Doesn’t Christianity demand not only that we conform to its doctrines, but also to be able to justify our ideas by appeal to the sources? I’ve enjoyed your posts on being an INFP tremendously, and wanted to put some of your ideas into practice, but I’ve felt unsure of how to do so as a Catholic. What if I end up being a heretic? I’m not a practicing Catholic, and my views are likely heterodox; but I can relate to your struggle. Studying Catholic theology and philosophy as part of my own search left me with some big questions, especially when challenged by friends or family. But I think there are a couple of different issues here. The first issue is about me as an INFP having embraced my inferior function (extroverted Thinking) and subsequently letting go of it. This is really a question of how we arrive at judgements, and I think you’ll find that Catholicism does not require you to arrive at judgements in a particular way, it just requires assent. In that sense it doesn’t matter whether a person says “I feel this is true” or “I think this is true”. There’s a lot of apologetics material out there that blames poor formation and sloppy thinking for the crisis in the Church and the broader culture. Apologists have written in criticism of “feelings” as a basis for belief. But honestly that’s just a prejudice given by people (mostly Cholerics – xNTx) who want everyone to play on their intellectual “home turf”. Feeling as a judging function in the Jungian/MBTI sense is more subjective, harder to communicate, and harder to scrutinise than Thinking; but that doesn’t mean it’s invalid. No one can claim that Thinking renders people inerrant and brings only objectivity and convergence of opinion. On the contrary, scripture and Church history are full of instances of conversion and holiness that have little to do with intellectual formation or education. So who says that Thinking is superior to Feeling? That brings me to the second issue: what is it that makes a person believe? I don’t have a simple answer to this one. Faith is a gift – and a divinely infused virtue. If God decides whom to give faith to, then is there anything for us to worry about? If you look at Aquinas on predestination, free will, and providence it is clear that nothing is outside of God’s command or God’s plan. Yet even your grappling with questions such as these is part of God’s plan, is it not? Does God make believers believe and heretics diverge? When I start thinking about these kinds of questions I quickly resolve to a feeling that “all is well”. I trust that inner knowing, and it clearly transcends my intellectual activity without nullifying it. What it does nullify are anxieties and worries, including (for me) any fear of being in the wrong. I feel comforted by the knowledge that everything is in God’s hands and always has been, and our role in it all remains a mystery even though the outcome is guaranteed. Isaiah’s words on the potter and the clay come to mind. If that still doesn’t bring me to accept certain teachings, then that is how I am. In the end, if you don’t want to be a heretic that is a pretty good indicator that you won’t be. Lately I’ve been thinking about and discussing the two basic types of choleric. I’ve also been watching a lot of Kung Fu Panda with my son. So let’s use the villains of Kung Fu Panda to explore the two types of choleric and how they function! Kung Fu Panda 1 and 2 feature well-developed villains with sympathetic origin stories. The villain of KFP1 is Tai Lung, an orphan snow-leopard adopted and trained by Master Shifu in the Jade Palace, who so excels at martial arts that he and his teacher both assume Tai Lung will become the Dragon Warrior. But when Grand Master Oogway decides Tai Lung is not Dragon Warrior material, Tai Lung is outraged. He goes on a rampage and is eventually defeated by Oogway and imprisoned. In simple temperament terms, Tai Lung is clearly choleric. He is proud, ambitious, confident, angry and vengeful against those who have wronged him. He pursues his revenge with the determination and focus of a choleric, having already displayed extraordinary patience, biding his time until the opportunity to escape presents itself. Having escaped, he immediately returns to his goal of obtaining the Dragon Scroll, convinced that he is – or deserves to be – the Dragon Warrior. 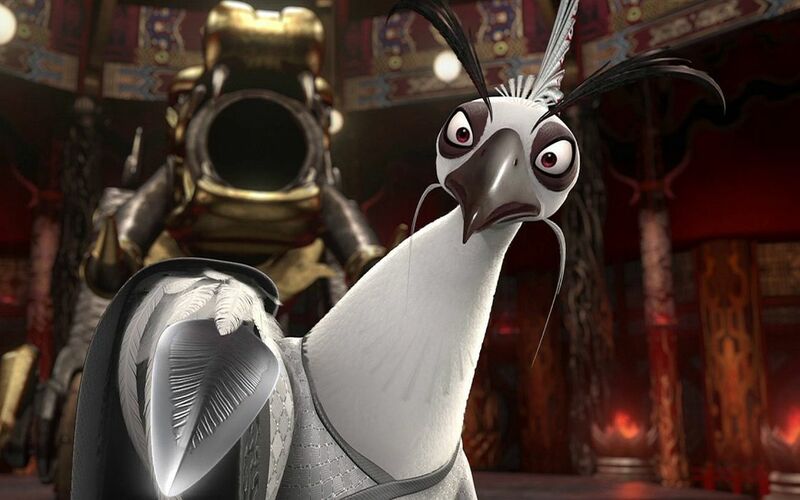 Lord Shen, the villain of KFP2, is the scion of a family of peacocks who ruled Gongmen City and brought joy to the people through their mastery of fireworks. When Shen begins experimenting with fireworks as a potential weapon, his parents consult a soothsayer who warns that if Shen doesn’t alter his course, he will be defeated by “a warrior of black and white”. Interpreting the prophecy, Shen takes his army to wipe out all the pandas in China and thereby avoid his fate. On his triumphant return Shen’s parents are horrified and banish him. Like Tai Lung, Shen is proud, ambitious, confident, angry and vengeful. He bides his time while further developing his explosive new weapons and awaits the opportunity to exact revenge (symbolically) against his now deceased parents, returning to his ancestral home before setting out to conquer all of China. The similarities between Shen and Tai Lung as cholerics are obvious. Of course they are also villains, which makes the comparison very direct. Disclaimer: Not all villains are choleric and of course not all cholerics are villains. But cholerics have qualities that lend them to being either great heroes or great villains….great anything, potentially. But there are specific areas of difference between Tai Lung and Shen that can be observed in real-world cholerics too. One of the most fundamental distinctions between cholerics is the nature of their ambition, which directly relates to their underlying skills or cognitive functions in an MBTI context. Tai Lung is a skilled warrior. He is very nearly the most skilled warrior in the world of KFP1, which is the foundation of his pride and also the means by which he pursues his ambition to be recognised as the Dragon Warrior. In MBTI terms, Tai Lung has introverted intuition (Ni). Like all the cognitive functions, it’s hard to understand Ni if you don’t have it. As a non-Ni user, the best I can grasp is that Ni-users intuitively know how to do things. Intuition is simply unconscious mental processing. The difference between Ni and Ne (extroverted intuition) is that Ne unconsciously processes information and patterns about the external world, while Ni unconsciously processes the user’s own actions, skills, and “how to do things”. Strong Ni users seem to have a knack or talent in at least one area, sometimes many. They know how to dress well and present well. They take to hobbies and skills with instinctive sureness. They might not be able to explain to others how they know, because the processing is unconscious, but in art, music, sports, or martial arts, their skill is evident. For an Ni choleric (INTJ or ENTJ) ambition is channeled through this innate facility. Hence Tai Lung’s pride and ambition are all about his own excellence, being the best. In his own mind he is the Dragon Warrior, and therefore deserves the Scroll that promises to further enhance his already superlative skill. Non-villainous cholerics with Ni might describe their ambition in terms of being the best they can be, or wanting to compete with themselves (as an INTJ friend put it). After all, Tai Lung doesn’t want to conquer all of China, he just wants to be the best. While Tai Lung is the embodiment of kung fu as an individual skill honed to near-perfection, Lord Shen will happily destroy kung fu in the pursuit of his own ambition. Instead of the power within himself, Lord Shen cultivates power over others, beginning with his intuitive realisation that the fireworks created by his parents could be used for violence. This detail of Shen’s origin story is a perfect clue to the kind of intuition he wields: extroverted intution (Ne). Ne is all about patterns and connections in the external world. As an Ne-user I can fully appreciate Shen’s recognition that the explosive power of fireworks could be “repurposed”. NB: but as a melancholic the idea doesn’t appeal to me! Shen’s power is almost totally externalised, as represented by the cannons he invented and the army of wolves and gorillas he commands. While he has kung fu skills of his own, they are clearly insufficient to achieve his true aims and ambition. Lacking the innate talent of the Ni choleric, Lord Shen’s ambitions are not grounded in his own personal attributes. This is reflected in his willingness to destroy his own ancestral home in pursuit of something greater. Yet at the same time, Shen’s Ne is apparent in his respect for the Soothsayer, a fellow Ne user whom he spares in part to prove her wrong, but also in recognition of her own gifts. As a fellow Ne user, Shen is intrigued by the Soothsayer’s predictions and insights. He sends her away only when he is confident that his own path is certain. In temperament terms, an Ni choleric would be choleric with a secondary temperament of sanguine, and an Ne choleric would have a secondary temperament of phlegmatic. But that’s an “all things being equal” scenario. In practice we can see that different cognitive functions can be exaggerated or diminished through circumstances, formation, and our own choices. Tai Lung to Shifu: Who filled my head with dreams?! Who drove me to train until my bones cracked?! Who denied me my DESTINY?!? Things get a bit subtle at this point, but I think the “filled my head with dreams” aspect would relate to Tai Lung’s introverted Feeling function (Fi) in either a tertiary or inferior position; my guess would be inferior. Fi is all about ideals, meaning, and “dreams”. But in an inferior position, Fi is very rudimentary. At various stages in life our inferior function is more influential, and it’s common for people to suppress their dominant function and be driven by their inferior. In Tai Lung’s case, that would mean his dominant extroverted Thinking (Te) was suppressed, and his inferior Fi was engaged and stimulated by Shifu’s excessive encouragement. So when Tai Lung is denied the long-expected meaning of becoming the Dragon Warrior he is enraged and goes on a pointless and destructive attack on the valley, ending in his defeat by Oogway and imprisonment. Living under the shadow of rudimentary Fi, he actually weakens his “efficiency”, his Te, and loses everything of value. A healthier choleric would have had a clearer sense of his own goals to begin with. He would have found a different way to excel, even if that meant spurning the Jade Palace altogether. Ironically his loss of control showed that he had less confidence in his own abilities, because he had tied them so strongly to the specific “dream” of becoming the Dragon Warrior. The search for meaning is his downfall not only in this first instance, but in his subsequent effort to obtain the Dragon Scroll. As an Ne choleric, Lord Shen has extroverted Feeling (Fe) and introverted Sensing (Si) in his tertiary and inferior positions; but in which order? There’s a case to make for either option: ENTP or INTP. Honestly, I’m not sure which is correct. But his character flaws certainly relate to extroverted Feeling, which is all about harmony with others. For Lord Shen it was his parents’ horror and rejection following his attempted genocide of pandas that scarred him. Shen thinks his parents hated him, and is unable to reconcile their repudiation of his actions with their parental love. But even prior to the incident, it is curious that Shen didn’t buy into the foundation of his parents’ power – the colour and joy that their fireworks brought to the lives of ordinary people. If Shen had more well-developed Fe he ought to have been more appreciative of that relationship between his parents and their subjects. The frightening aspect of Lord Shen’s Fe is that he massacred the pandas without realising the effect this would have on his parents, and without having previously heeded their worries and fears about his attempts to weaponise fireworks. It’s suggestive of psychopathy – not only that he would massacre the pandas but more importantly that he would fail to understand his parents response! What went wrong with Shen? Unlike Tai Lung, there is no indication that Lord Shen was misled, or that his head was “filled with dreams”. What seems more likely is his parents’ failure to properly educate their son and instill in him more compassion or care for others. By the time he was willing and able to massacre all the pandas in China, it was already too late in his development. While this indicates a failure to develop Fe, it also suggests (or rather, my brother suggested while discussing this question) an Si-related failure to fill a young Shen with formative memories that would reinforce the virtues of compassion, benevolence, and mercy. Shen’s attempt to use his intellect (Ti and Ne) to conquer China with gunpowder is a merciless and violent recapitulation of his parents’ “conquering” Gongmen City through the joy and wonder accomplished by their fireworks. Without an appreciation for the happiness of the people and the virtues that go along with that, Shen would see his own path as a bigger, better, and more glorious version of his own parents’ success. Learning about the four temperaments helped me understand myself, but it also helped me understand how and why some people act like complete a***holes when it seems like they should (and maybe do) know better. Cholerics in general are weaker in the “feeling” functions of the MBTI. In Big 5 terms, they are more “disagreeable” than “agreeable”. Villains with troubled origin stories aside, cholerics tend to be proud, which they might prefer to describe as being objective about their own strengths. For Ni cholerics, their strength is the innate talent facilitated by introverted intuition, coupled with extroverted thinking (Te) that helps them be very goal-directed and efficient. For Ne cholerics, their strength is the systematic world-modelling comprehension of introverted thinking (Ti), enabled and given full-flight by extroverted intuition. Being strong and disagreeable is advantageous if life is a competition. But cholerics struggle when they seek to “win” at non-competitive goals or attributes such as being agreeable. A common trope for successful cholerics (villainous or not) is to reach the pinnacle of success only to realise that they have neglected or even harmed the things they valued but did not excel at. That’s why the choleric “solution” is essentially a softening or slowing down where it might otherwise be easier for them to fight, compete, and perhaps win. It’s for cholerics, I think, that we have the spiritual advice to embrace weakness, meekness, humility, and poverty of spirit. I’ve gone into a lot of depth in the Myers-Briggs Type Indicator, albeit haphazardly as befits a P-type, right? But lately I’ve been looking at the simpler measure of the P and the J, and what that means for how we ideally function in the world. I’m an INFP, who has ended up sharpening his J approach to life in order to “get s*** done!”, because if I stay in P mode I’m afraid life will just blend into some kind of seamless, mysterious whole without my understanding or control. Actually that sounds kinda nice. My wife is a genuine J type, yet somehow we’ve ended up inverted. I’m usually in control, deciding what we’ll do and when we’ll do it, while she’s been seemingly content to follow my lead and see what happens. Which has worked. But it’s been a lot of work, with each of us using our weaker functions to get through life. Logically the answer is to revert to our genuine types. That means I should relax, accept that I’m intrinsically disorganized by worldly standards, and let my wife take up some of the slack. But it’s really hard to go against years of training and conditioning. It’s really hard to stop J-ing, to just let go and not even write blog posts summing up the awesome insights that come to me. And perhaps that’s because the simple P-J message is a little too simple after all. It’s meant to tell us which of our functions is extroverted – the perceiving one, or the judging one. But if you’re an introvert, your extroverted function will be auxiliary, subordinate to and weaker than your dominant. So I may be a P-type, but since my dominant function is a judging function, I’m not the most P that a P could be. Likewise, my wife is a J-type, but her dominant is a perceiving function, so she’s not the most J kind of J either. IP types have a dominant introverted judging function, which will make them seem more like judgers (J types) than other P types. And for IJ types vice-versa. Typical of an INFP (apparently), these kinds of renovations of my theoretical model come easily and frequently, but they don’t change the underlying “feel” I have for what is important. When I act or think like a J-type, I might be relying too much on my inferior Te (extroverted Thinking) function, as I previously thought, but another way of looking at the whole situation is that I have unhealthy Fi (introverted Feeling) pushing me to accomplish things. When too many possibilities proliferate, I get tired and want to put away my MBTI toys because I sense that achieving perfect understanding will not yield proportional benefits to me. Yet this in turn reflects an aspect of my inferior Te – taking single variables and enlarging them until they seem to account for everything. Yes! That’s the one-single mistake I make! (ironic laughter). The good news is that for an introverted Feeler the actual thoughts don’t need to be nailed down. Despite my past attempts to find all the answers to everything and be right all the time, I don’t really need to know anything, so long as I know how I feel. I’ve been using the MBTI functions as a way of sharpening focus on the four temperaments. This is because pragmatically the functions allow a finer-grained analysis of the temperaments. For example, what’s the difference between a melancholic-phlegmatic and a melancholic-sanguine? Both are NF types. Melancholic-phlegmatics are xNFP and melancholic-sanguines are xNFJ. This means that melancholic-phlegmatics are using extroverted intuition (Ne) and introverted feeling (Fi), whereas melancholic-sanguines are using introverted intuition (Ni) and extroverted feeling (Fe). So in the first instance, although both are melancholic with the combination of feeling and intuition, the NeFi combo is already a more introverted way of being than the NiFe combo. Fe is externally oriented, meaning that the melancholic-sanguine makes decisions according to their sense of how others are feeling, for the sake of group harmony. Fe types want to connect with others and maintain good relationships, whereas Fi types are more motivated by internal coherence and authenticity. In addition to the orientation of the feeling function, the third and fourth functions of either type also play a role in describing the difference in temperament. Melancholic-phlegmatics’ third and fourth functions are extroverted thinking (Te) and introverted sensing (Si). Melancholic-sanguines’ are introverted thinking (Ti) and extroverted sensing (Se). The significant part here is that Si and Se are the determining functions of the phlegmatic and sanguine temperaments respectively. Si gives the phlegmatic their inward, mnemonic focus. Se gives sanguines their sensory, outward, experiential focus. That’s why these two types of melancholic can be similar, yet in other ways so distinct. What makes one melancholic partly phlegmatic is the inward orientation of their Feeling function plus their introverted sensing (Si) in third or fourth place. What makes the other melancholic more sanguine is the extroversion of their Feeling, plus the extroverted sensing (Se) in their third or fourth place. But the functions are just useful, finer-grained descriptions. No one knows if they are actually different cognitive functions, and so we can ask which is the underlying reality: MBTI functions, or temperamental factors? What I mean by temperamental factors is that the four temperaments are typically described as combinations of two factors – the clearest of which (in my opinion) are excitability and duration of impression. Are the differing degrees of melancholic due to real differences in cognitive function, or are supposed differences in cognitive function just ways of describing varying degrees of melancholy? In other words, are Fi and Fe different things, or are they just different degrees of the same thing? As far as I can tell, it’s quite possible that Fi is really just a less excitable form of Feeling, and Fe a more excitable one. But going a step further, I’m not sure that Feeling and Thinking are necessarily different things either. It’s plausible that F and T represent less excitable and more excitable forms of the same cognitive process. In effect, F is like a blurred and impressionistic version of the sharper, detail-oriented T.
There’s a widespread perception that feelings are an untrustworthy guide. I think this probably comes from situations where people have bucked the conventional trends and rules of life and justified it rightly or wrongly on the basis of feelings that defy scrutiny and interrogation. But the same thing happens all the time with thinking. Thinking too can be an untrustworthy and dangerous guide for many people, but in those instances we tend to label them “stupid” or “irrational” or “stubborn” rather than criticise them for thinking per se. The truth is that there’s such a thing as good and bad feeling, just as there is good and bad thinking. What makes either one good or bad is the degree of honesty with oneself, and the knowledge in and around the thought or feeling that guides us. For example, if we think that vaccination is bad for us, or that raw chicken is okay to eat, then we are being guided by thoughts that are either insufficiently scrutinised or else coloured by some ulterior motive. Similarly, our feelings can be coloured by deeper motives, or we can be mistaken in our own interpretation of them. In accord with temperament, I think we can use either thinking or feeling to work out what we want to do. But it’s up to us to be honest with ourselves and clear about the nature of the thoughts or feelings we are following. Perhaps the best way to put it is that both our thoughts and feelings should be genuine or authentic. In my own life I seem to get into trouble when – either thinking or feeling – my words and actions are coloured by ulterior motives of which I am not fully conscious. Things like insecurity, escapism, avoidance and so on. I might have a desire to say something, but what is driving that desire? Is it the genuine expression of a good feeling, or is it a shady evasion of a bad one?